One habit I let go of after college has been reading the Bible, just myself, every day. I had my Bible on the shelf right next to my bed and would spend about fifteen minutes reading a section of scripture before I would go to sleep. It helped to ground me and center me. Sadly, I let that habit fall away and even though we do family devotions every night with our sons, I have let my own personal Bible reading fall by the wayside. So I’ve been looking at Bible apps on the iOS App Store not because I think it will be some magic bullet to get me to read the Bible more (there is still something wonderful about the tactile nature of a real printed page), but because I thought it would be beneficial t know what is out there and see if it could help in some small way to get a good habit started again. So I have looked at two different apps and found them both to be pretty good. Both of them fulfill the requirement of allowing you to have the Bible on your iOS device with or without a network connection. Both are also free. In that sense, you really can’t go wrong with either one. However, I do find both lacking in some areas. 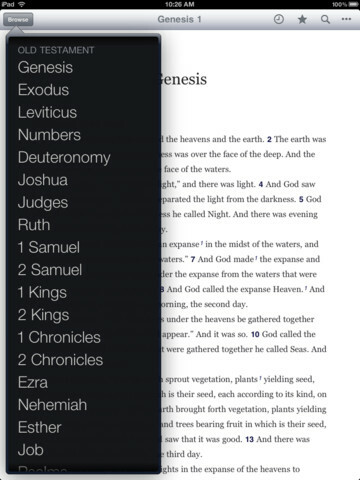 As the name implies, it is simply the ESV (English Standard Version) translation of the Bible for iOS. I won’t get into translations, but if you are looking to have multiple translations available, you are going to want to look elsewhere. The reading experience in this app is quite good. Navigation is also simple and straight forward. 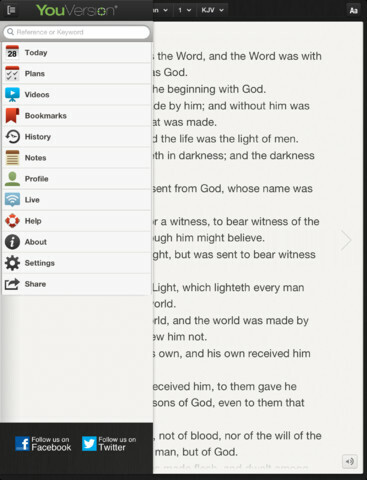 Overall, a very good app, if someone minimal, and a great choice is the ESV translation alone will suffice. Bible is another good application. While the reading experience (in my opinion) is not as good (too much chrome for my liking), and navigation can be a little cumbersome (small tap targets on individual drop downs), it has some major benefits over the ESV Bible app. The most notable is that you have access to a number of translations, including the ESV translation. You can view the translation online or download it to your devices so that you can view it both more smoothly and without a network connection. I currently have the King James Version, English Standard Version, and the Holman Christian Standard Bible downloaded on both my iPhone and iPad and enjoy reading sections in all three to see the language differences. You can sign up for a YouVersion account in the app to sync notes and activities and also view notes on passages made by others readers. The big thing for me is that you can subscribe to Plans to help you choose what to read on a given day. I’ve started “The Bible in a Year” plan and I’m hoping to complete it by this time next year and then maybe move onto some more topical plans. It is nice to take away the excuse of not knowing which section of scripture to read in a given night and just tap to the next area and read. It takes away some of the Old Adam that can get in the way. As you can guess, I’m using the Bible app as my Bible application for the moment. The benefits of a YouVersion account coupled with plans is enough to overtake the somewhat mixed reading experience of the app itself. Along with multiple translations, it is the one app I would recommend to anyone on almost any platform. Like I said, this is no magic bullet, but it is something to keep me a little more honest with my Bible reading habits. I have YouVersion on my tablet. I just wish all translations were available for download, or more so at least. I also have a few issues with how the navigation works. The translations I wish they had for download would be both NIV 84 and NIV 2011. Sadly, I think only NIV 2011 is available online now.